In June 2016, Harry Amend received a call regarding Jim Straw, principal of Freeman High School. Amend was asked to come in and “keep the chair warm” for when Straw could return. Amend committed to stay as long as needed, estimating that might be for the first month of school. Harry Amend holding Dinah Rawson on her birthday in 2004. Photo by Jodi Rawson. In December 2016, while Amend was still keeping his chair warm, Straw was diagnosed with Hodgkin’s Lymphoma, beginning chemotherapy treatments. Amend described Straw as a “five- tool player… like in baseball, he can do anything.” Amend hired Straw back in 1992, his first year as Freeman School District’s superintendent. Freeman staff and community are hopeful that Straw will heal and get strong enough to return full time. In the meantime, Amend is committed to staying where he is needed. 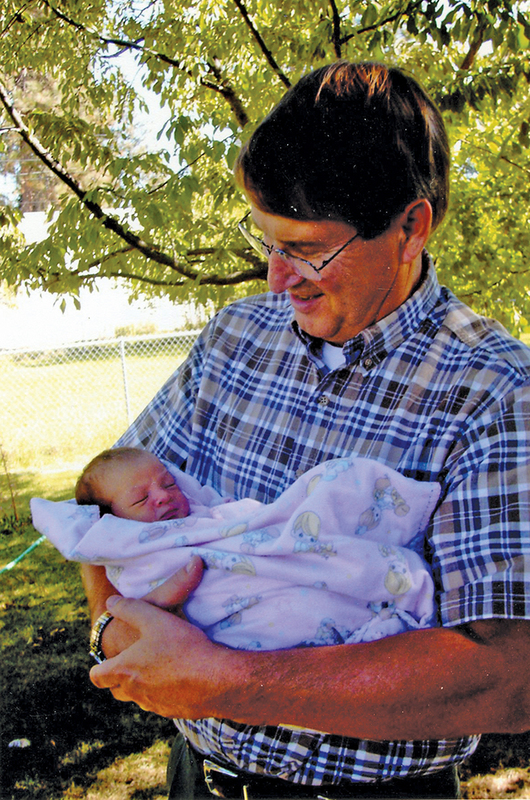 In 1999 Amend retired as the superintendent of Freeman School District with 30 years of service in the public schools of Washington state, but he continued to do what he loved until 2008. He was superintendent of Flathead school District in Kalispell for three years and superintendent of Coeur d’ Alene School District for another six years. From third grade until Amend was offered a teaching/coaching job at Central Valley High School in 1969, he wanted to be one of two careers, a baseball player or a doctor (like his respected and well loved father). He grew up in a healthy and loving family and has a strong faith. “God has made all of my major decisions,” said Amend, who believes that his career path has been laid for him and that he is serving exactly where he needs to. On Sept. 13, 2017, Freeman High School was rocked by a traumatic mass shooting. My dad is one of several students who has grown up to hold on to Amend as a lifetime mentor. As a baseball coach, Amend was a shoe-in mentor for my dad in the early ‘70s, but he offered much more. Love bubbles out of Amend naturally, a stark contrast to the abusive/neglectful step-father that my dad grew up with. “I honestly don’t know where I would have ended up without a role model like Harry,” said my dad. While Amend was working as Superintendent of the Flathead School District, he got a call from my dad, imploring him to mentor his wayward, college-dropout daughter. Amend and his wife opened their home to me, told me I could live with them as long as I needed, took me to dinner, offered me the keys to their car to get a job in Kalispell, and when I failed and got anxious and itchy feet a month later, I wasn’t shamed. Amend says he believes in leading with “mercy and grace, rather than judgment,” and from my perspective, he has been very successful. I will always remember the hug Harry gave me when I felt like the whole world had rejected me. I just fell into his open arms and balled my eyes out. Amend has been told, as a result of the Freeman tragedy, that you never get over it. He has talked to Columbine survivors, who still cry when they speak of the shooting almost 20 years later. Many people have sought professional grief counseling, which has been donated extensively to the community of Freeman. Amend’s schedule is busier than ever with the most challenging school year of his 40-plus year career. He is working full time with no real end in sight. Straw is still healing. Freeman is raw with wounds and only beginning to heal. “During tough times people need to stick together. We need to look out for those who are hurting,” says Amend, and this morality fuels him, from retirement to Freeman.